Unfortunately the focus is slightly off in this image, but it gets the point across. This is a comparison of the difference between GW’s Devlan Mud wash on the left, and Army Painter’s Strong Tone dip on the right. Both figures were painted with the same base coat colors in the same areas, and both were sprayed with Army Painter dull varnish after they were dry. Overall, for these colors I prefer the Army Painter dip. It darkened the colors a bit less, and stayed in the cracks a bit better. 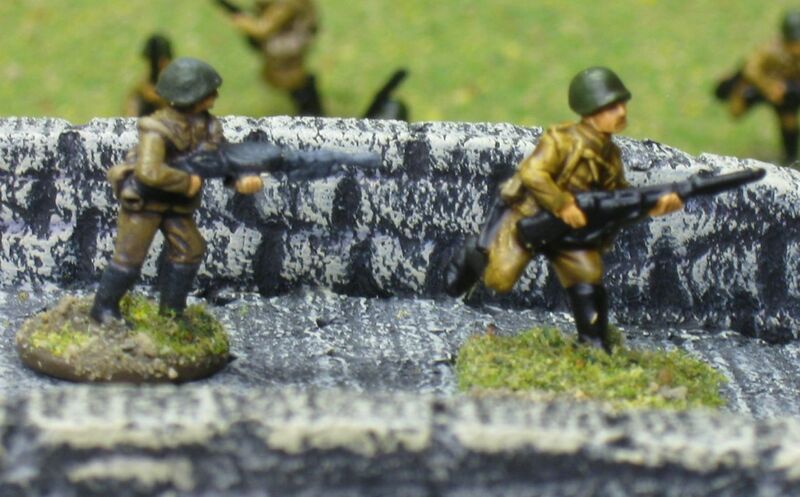 The black on boots and gun were affected less by the Army Painter dip than the wash. I also don’t like how it deadened the green helmet. I really like Devlan Mud, and I will still use it in cases when I don’t want to wash the entire figure. But Army Painter works really well. It’s almost depressing how good a job it does, compared to making an effort. Unfortunately you can hardly tell the difference between the two khakis used for uniform and belts. These are 15mm figures I picked up at the flea market at Fall-In. As far as I know they’re Quality Castings, but no guarantees. They seem small, but it may only be compared to the Ancients I usually paint. I got them done quickly: 50 infantry in 2 nights of painting; and another 6 LMG’s in about an hour. I used simple flat base coats of Vallejo paint and then applied a GW wash or Army Painter dip. They came out good enough, which is just what I’m looking for. After playtesting BAPS with Frank last night, we decided we won’t be using BAPS for this game. Instead we’ll probably fall back on Disposable Heroes again. What? A post that isn’t about games? Weird. On the way home from Fall-In (obligatory gaming reference), I picked up some home made Sauerkraut at a farm stand. I mentioned to JM “I like live food. Well, as long as it’s small enough that it won’t run away.” It was pretty good sauerkraut, and it reminded me that I wanted to try making my own. Apparently lots of people are doing this these days, but I hadn’t done it yet. After finding a suitable bucket (Thanks, Brigid and Ross!) I’m good to go. This one gallon bucket seems to be the perfect size for one large head of cabbage. 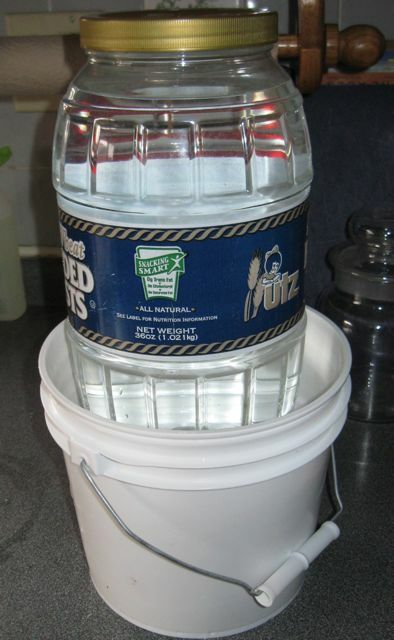 The container of water is a weight to press the liquid out of the cabbage… not much to see here. I’ll update in a while when I see how it’s coming along. The Two Davids DBA campaign games are a highlight of the HMGS conventions. When I heard the theme at Fall-In was going to be Gallic Wars, I had mixed feelings. I don’t like the Gauls as an army, but I basically already had them painted anyway so it wouldn’t require any effort. After actually playing the campaign, I changed my mind: this was an excellent campaign and I really enjoyed playing this army in historical context (but without Romans). 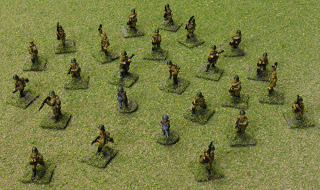 The campaign had 20 players, with only 7 armies that weren’t a (possibly modified) Gallic list. 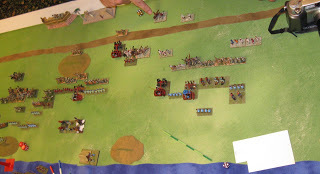 There were two Romans, but most of the other armies were also warband-heavy. Most of the armies were built around a core of warband, and this gave me a lot of opportunities to learn how to use them (or how not to use them). The armies were all quite evenly matched, but the Davids customized some of the lists, and this provided just enough variation to keep things interesting. I’ve written a bit about the campaign format before, so I’ll stick to what actually happened. Unfortunately I didn’t get many pictures during this event, so you’ll have to use your imaginaion. 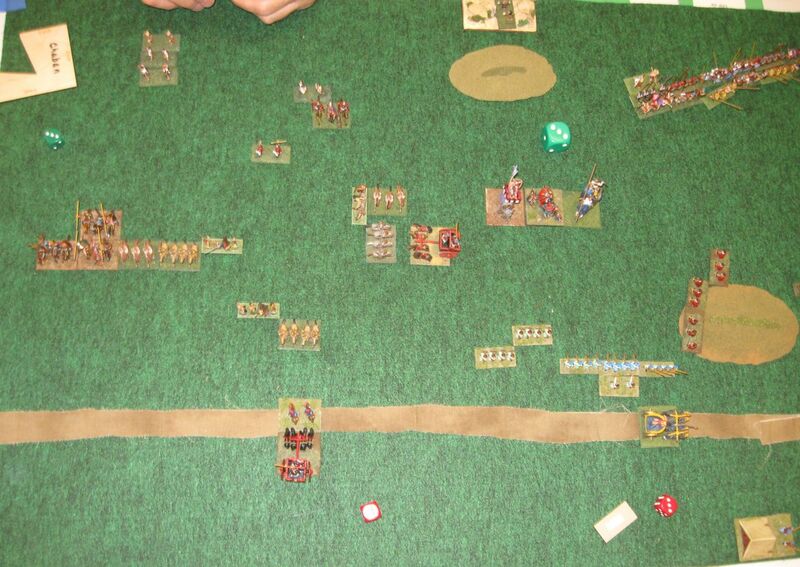 In the first campaign round I drew a high enough number that I was attacked: by David Kuijt. This was a short but interesting game. I set up to one side of a central wood, but a road ran the length of the board on the other side. DK ran down the road to take the woods at my flank. Although I immediately knew the danger, and managed not to get my cavalry sucked into the woods, I did make enough mistakes to lose. I didn’t have enough warband close to the woods to hold it; and I wasn’t aggressive enough running around the woods with my cavalry to maintain an advantage with the foot I did have. The entire battle was fought over the woods, the rest of the board hardly made any difference. The tile selection was modified somewhat this time. Battle winners always chose two tiles and assigned one to their minions. David gave me the 1, allowing me to attack. I chose to fight against David Bostwick. Unfortunately, I also got the 1 on all my combat rolls, and I was quickly and completely crushed. I made first contact, and chose fights that were to my advantage; even so, I lost 3 elements on my turn. On David’s turn, he killed 3 more of my elements. Several of these were 3-2 in my favor, which required a 6-1 split for me to lose… but I managed, somehow. I lost, but was still DK’s vassal. The next round David Bostwick chose the tiles, and kept the 1 for himself; apparently I lost it in my failed attack against him. He wanted a rematch, and attacked me back. This game was a bit longer, but it was still bloody… and luckily, this time it went in my favor. However, since I defended, I didn’t gain him as a vassal. In the fourth round, I almost had a low enough number to attack… but not quite, so Jan Spoor attacked me. 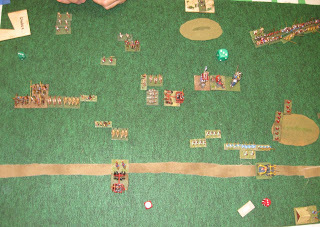 I don’t remember this game well, but I think this was when I decided double-ranked Warband were too dangerous to use regularly: I lost 4 elements in the form of two warbands along with their rear support. This put me under Jan’s control and lost DK a vassal. Meanwhile, in round 4, an interesting thing happened. Two vassal trees attacked each other in a way that resulted in a loop. Larry was DK’s vassal; Rob was Larry’s vassal; Doug was Rob’s vassal; and DK was Doug’s vassal. Apparently there were some intergenerational marriages going on here. I think this was the first time this happened in a campaign game, and the main result was that all of these players ended up with big targets on their backs because claiming any of them would break the loop and potentially give control of all four of them to a new master. 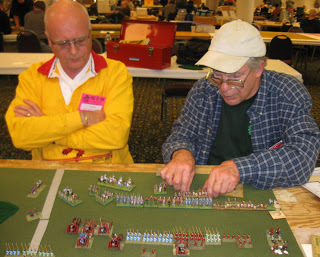 In the final round, I was able to attack again and attacked David Shepps, who was playing Early Germans. 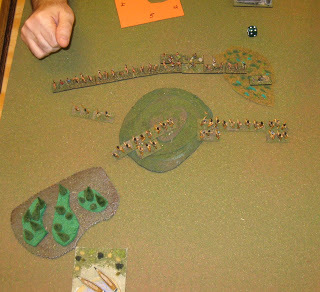 He had no mounted support, and deployed to the side of a board-splitting wall of woods in a line of double ranked warband, with a warband and psiloi perpendicular and behind to protect his flank. I attacked frontally but also advanced two warbands through the woods. They acted as bait and died for their service; but it disrupted his line enough for me to take advantage of him and eventually secure a win. I won with 5 elements killed to his 4, a close match. This gave me my first vassal ever! In the end, I feel like I played well, learned a lot about warbands, and overall had a really great time. I’m looking forward to future Two Davids campaigns that have more similar armies like this. It’s sort of like playing a tight theme night at Legions but with more games and a wider variety of opponents. Saturday afternoon was the Open Scramble format tournament. I thoroughly enjoyed this event and look forward to playing a similar event again. The Scramble format is interesting and different, but like Matched Pairs, you have to be willing to let other players touch your army. In the first round, each player gets a random army from one of the other players, and is matched against a random enemy. Players were required to select specific terrain pieces to be used in all rounds as well. 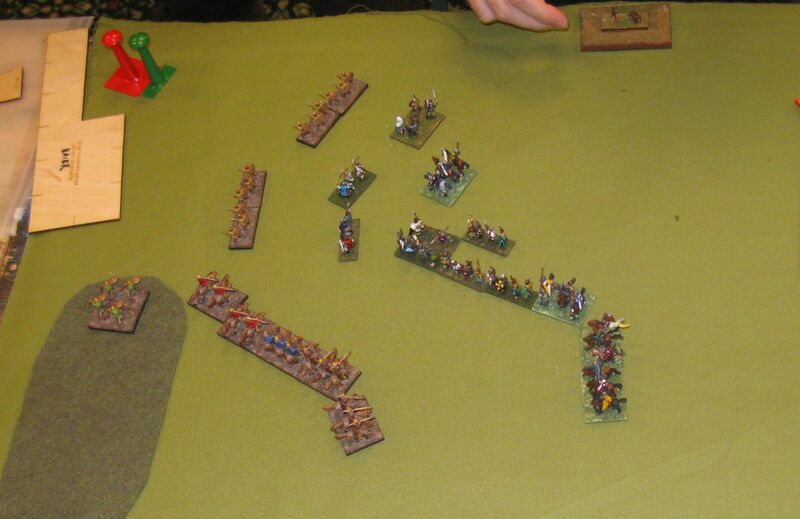 In the second round, winning armies are matched with losing players, but no player can use their own army. In the last round, each player uses their own army. The organizers of this event decided to use a timer to ensure the rounds were all exactly one hour long. I liked this official time keeping, but probably only because my games weren’t too long. I brought two “beater armies” for JM and I to use. These are built primarily from the “old school” Carthaginians I bought at Historicon, and since I didn’t paint them and they’re already mostly damaged, I didn’t mind if anyone else used them. I let JM use Gauls (II/11), which I was saving for the Gallic Wars event, and I used Later Carthaginians (II/32) without any elephants, and with 2x3Wb, 1x2Ps for the other option. In the first round, I ended up with JM’s Gauls, and I was matched against Jason Bostwick, using Later Achaemenid Persians (II/7) with the all-Auxilia option and a scythed chariot. This game was over quickly. Once again I was crushed by an invincible Scythed Chariot. Jason flanked me and rolled up my line, winning 4g-0 (as shown on the right). Our results were so skewed that we predicted I’d end up with Jason’s army from the first round, and he’d play with mine; and that’s just what happened. He defended and set up terrain. I ended up with a large wood on one flank, and he set up in a line to avoid it. I set up on my left flank, intending to use the woods as a highway for my light foot, and sweep around his flank on my left while denying his right flank. This is exactly what happened. It was a long, hard fought battle, and early on I lost many combats that were statistically in my favor; including losing the scythed chariot almost immediately. Eventually my luck turned and I killed enough elements to win. Neither of us remember the final score or have pictures of it, unfortunately, but we know the organizers’ notes were incorrect. In the final round, I fought against Zenboy, aka Michael Downey. I had my Later Carthaginians, and Zenboy played his Later Achaemenid Persians. He defended, and placed a wood on one side with two gentle hills and a road that played no effect in the game. This was a much more straightforward fight than the previous one: we stood in a line and walked straight forward, both of us happy with the element-to-element matchups we had. Zenboy lost his Scythed Chariot early on against my psiloi, and it was all downhill from there. Judging by the final photo at the right, I ended up losing only one light horse, and he lost 5 (since the SCh didn’t count towards victory). I really enjoyed this event, despite the fact that every round I played with or against an army I brought, and only one army in one game was an army I don’t own. All my opponents were fun to play with, and I learned some tangible lessons. I like the balancing factor provided by people playing with armies other than their own. 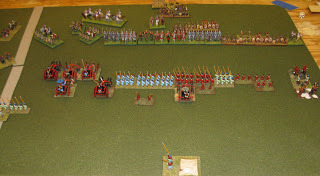 I’d like to play another scramble format event, but next time I hope I get to play with some new and intresting armies. There were two niche events covering the same theme: American armies. Since I had painted my Tlingit (IV/11) and a camp, I originally planned to play in both events. After playing in the first event on Friday night, I was uninspired to get up early on Saturday just for my bows to die versus Warbands again. 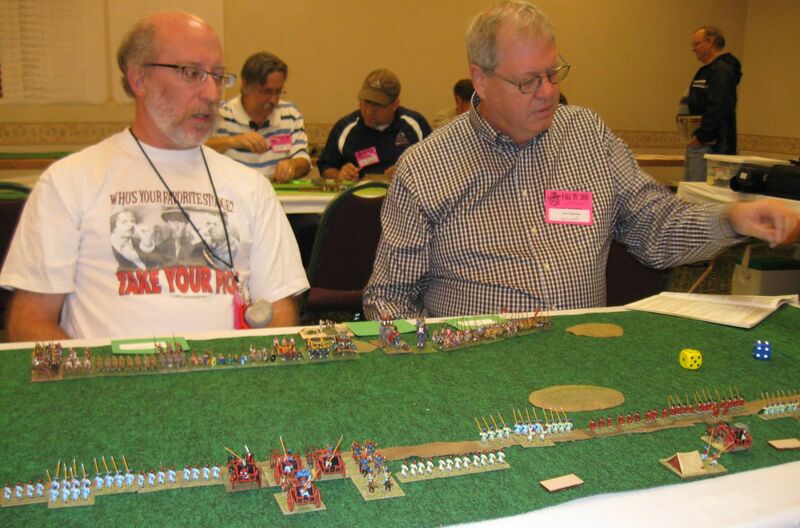 “1491” was a pyramid format event on Friday night. In this format, the first round is a series of 1-on-1 games. In the second round, the winners and losers are combined to form two player teams who play each other, carrying over their losses from the first round. Luckily we had 8 players, allowing the third round to be two full four-on-four games. I’ve enjoyed the Pyramid format in the past, but unfortunately I didn’t have as much fun this time. Although I really like the way my Tlingit look, the Northwest Americans (IV/11) just aren’t very competitive against their contemporary enemies. They have 10 bows, and I didn’t play against anything except warband-heavy armies in this event. In the first round, I lost against Ted Galacci, 4-1. In this event, they matched one game’s winner with the other’s loser, to enourage you to really wipe out the other guy. In the second game, Bob Beattie was my commander in chief, and JM played under Ted’s leadership. Our side won 7-2, which sent JM and Ted to play under our enemy’s C-in-C; and we got Mike Guth and another player whose name I unfortunately forget; he left early. By the last round, both sides had 25 elements. Or was it 27? Maybe 26. I think it was 25. In any case: this was four players playing about 2 armies worth of elements. We rolled 4 PIP dice and they were assigned by the C-in-C appropriately. This left us with almost twice as many PIPs per element compared to a normal game, giving a relative advantage to warbands and players who maneuver inefficiently. In the end, we lost. JM’s three remaining elements apparently killed more than their weight in gold… shiny, Aztec gold. The goal of matching winners with players who lost to someone else was to encourage players to kill as much as possible instead of making arrangements to lose with minimal losses and gain an advantage in later rounds. I’m not sure this worked out as well as it was intended to. I don’t think it was as satisfying to play under the command of someone who didn’t beat you; and unless you made an effort to avoid it, it was easy to end up playing against your original opponent in subsequent games. Finally, I think the game works better with more elements in play during the later games. I’m currently not very inspired to play my Tlingit. They’re pretty, but 10 bows and 2 psiloi, while flexible, don’t leave much room for deception. I think I’ll have to let them sit on the shelf for a while to rebuild my interest. I am interested in trying another Pyramid format event. JM and I discussed it on the way home, and decided that Samurai armies would work well in this format. Battles between individual Samurai and joining forces against a common foe feel just about right for this period. Larry heckled us a bit for planning ahead and bringing a document describing our plans. Yes, we were inspired by the Two Davids who make similar documents in preparation for their battles. However, our goal was not primarily to win. We only wanted to fail to make utter fools of ourselves, and I think we succeeded. Planning ahead allowed us to think on our own time instead of wasting our opponents’ time, and gave us a baseline to measure what worked and what didn’t so we could learn more quickly. Neither JM nor I have a very strong knowledge of historical tactics used by real generals, and neither of us have much experience in BBDBA or other larger scale Ancients games, so planning was also intended to offset our deficit in experience. I’m glad we did it and we’ll likely do it again, for similar reasons. There were eight entries in this tournament. The field was split by army year into two groups of 4, and everyone played everyone else in each group. The winners in each group played the finals some time after the convention was over; I never heard the final result. Our first game was against Larry and his honorary Stooge partner Will. “We came all this way to play against you?” They brought Seleucids (II/19), which combined the elements that posed our greatest anticipated challenge: pikes and elephants. We forgot about the possibility of Scythed Chariots, and they were the killer this game. We defended, and set up terrain as planned: three small central hills with a road the long way behind one. It wasn’t much, but we placed it where we hoped we could take more advantage of it than our enemy. The plan for elephants was to avoid them, or try to shoot them with bows. Larry had an interesting command structure around his elephants: he combined three elephants and three scythed chariots with one other element. Since the expendible chariots don’t count towards the break point, the command needs to lose 6 of its 7 elements before it’s destroyed, providing additional protection for the elephants. For the pike, we wanted to outflank them with light horse and peel them apart. Unfortunately, they used their pike in passive defense of a well defended position. We decided to win elsewhere, and didn’t approach the pike. I’m not sure if this was a good idea or not. Our failure and prompt demise came on the opposite flank. Will’s scythed chariots totally destroyed our line, and then broke through to the road where they could kill whatever they wanted. These things are called “expendibles” for a reason: they aren’t supposed to live very long. Will rolled really well a few times, and that provided him with the tactical advantage to roll us up. This was our fastest loss in the tournament. One important lesson I learned here, was to pay attention when to let your broken command flee. They’re only useful when they’re still in the way; after that, they’re screwing up the high/low/mid PIP die rolls. In the second game, we faced the Two Davids: David Schlanger and David Kuijt playing some kind of Romans (Early Imperial, I think) with an ally (Arabo-Aramean, I think). Their army didn’t have any particularly problematic elements, but the Davids are very good players. We defended again, and placed a waterway to reduce our time to contact. It did an adequate job of that, but probably wasn’t really necessary since neither of us was particularly fast. 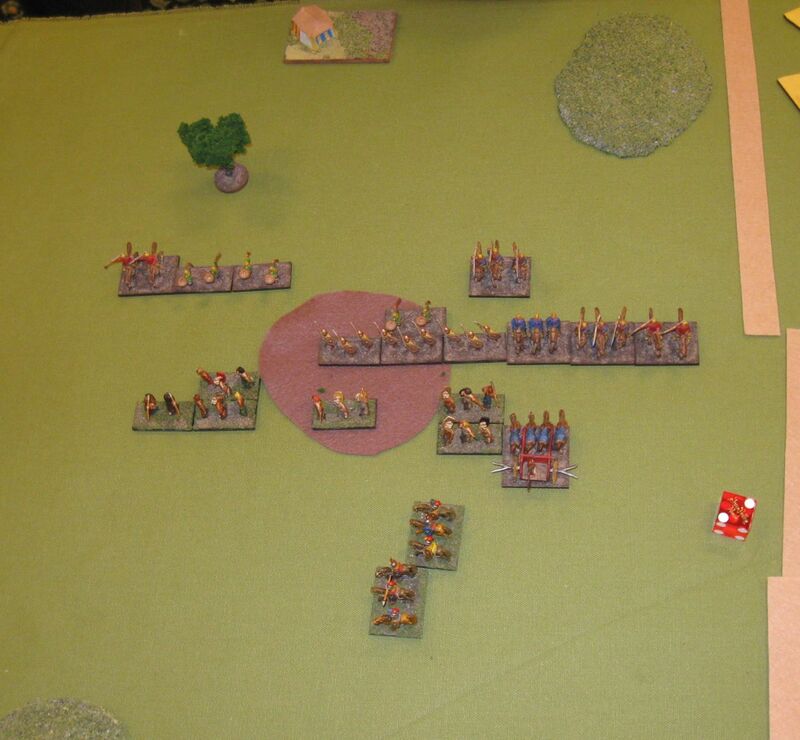 They refused our left flank with their artillery and forced us to play our attacking force on our right. This was a very interesting game, I enjoyed it a lot. There was a lot of back and forth on our attacking flank, but the Davids did a great job and I learned a lot. We had some localized advantages on occasion, but unfortunately I missed our prime opportunity to pull a win from the jaws of defeat. I had a chariot within striking range of the enemy camp, and asked DS about the finer points of attacking a camp. I decided not to attack the camp, but in the mean time I missed the fact that I could’ve flanked their commander in chief, which might have ended the game in our favor instantly. Instead, they broke our high PIP command, then a second command, and won. The Davids did a wonderful job of using two of their commands against one of ours, and winning through PIP advantage. 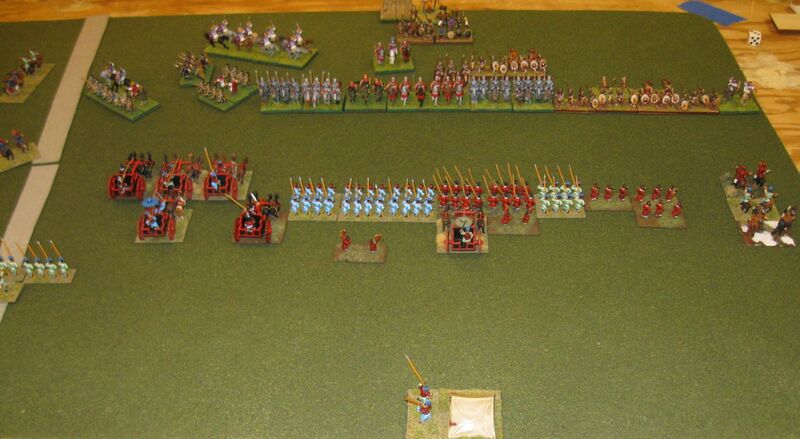 The high PIP Roman command and the allied command were next to each other, and moved into overlapping positions. This allowed both commands to work together and share PIPs, whether the critical position ended up being in the center or on the flank. We tried to start doing this later in this game and throughout our next game, but since we hadn’t planned for it, we didn’t do a great job. I think the Davids’ choice to use an Ally makes this easier: by placing the ally next to the high PIP command, they can always easily tell which elements are a part of each command. The downside is that ordinary maneuvers are always more expensive since they’re split across two commands and can’t use a single PIP group move. Our third game was against Team Canuck: Michael Saunders and Colin Rice. They played Patrician Roman (East) II/83b, I believe. They had a wide variety of troops, but without any elements that were particularly problematic for us. They defended and placed terrain: a wall of woods down the center of half the board, a road perpendicular, and the rest of the board empty. They set up their first two commands in the open area, and left their bad going troops (aux, warband) in their last command. We didn’t stand a chance in the woods, so we compressed our spears into double ranks against their knights and stuffed ourselves into narrow frontage in the open. We tried to overlap our commands somewhat, but we limited this to the elements we could tell apart when they stood next to each other. They deployed their light troops behind their main line, and the entire battle was limited to one half of the board. They ended up spending several turns to redeploy and maneuver their troops without advancing at all, before we made contact. We were running as fast as we could, but just couldn’t get there before they had time to fix their deployment problems. Once our lines met, we had an advantage early on and damaged all of their commands, but none to the breaking point. It felt like we had a real chance of winning. We even had several 4-3 rolls against their C-in-C, but they all failed. Finally, the Canadian luck turned, and they broke our commands before we did anything else to theirs. Just before time ran out for the round, they killed us. I really enjoyed this event, and I look forward to playing BBDBA Doubles again. JM and I worked well together, and I think with a few refinements we can increase our expectations to include actually winning a game. Our plans were not obviously bad, and I’m glad we spent time on them. Their simplicity helped us implement them correctly. Neither of us are content with our army choice, but we want to revisit the army “later.” Warring States Chinese are quite low on bad going troops, and don’t have many different element types available. Between the two of us, we have enough BBDBA armies to practice together effectively, and with our current level of motivation we should probably start soon. I wouldn’t want to give any secrets away, so I won’t mention our options for Cold Wars. Almost everything went according to plan; at least, nothing went horribly wrong. JM and I had a great weekend and we both hope to go to more conventions in the future. Driving to Lancaster always confuses me for some reason, and I found new and different ways to get “almost lost”. We made it there in time for registration, but just missed getting into Larry’s game (Auxilirama). Staying at the Lancaster Host was a good idea, and I’ll do it again. It costs more than the closest cheap hotels, but being in the same building as the convention left more time for gaming between sleep breaks. We still had to go outside to get to the dealer hall, otherwise I wouldn’t have gone outside all weekend. Speaking of the dealer hall: I seem to be getting better at not buying things I’m not going to paint. Between the dealer hall and flea market, the only unpainted figures I bought were 15mm early WWII Russians. I plan to paint these up for a scenario I’ll run when Mike is in town over the holidays. I’ll have to fire up the airbrush, since “all one color” is faster that way. I also bought a variety of other materials and accessories: more bases-by-the quart and adhesive “plasteel” from GF9; a few nicer road segments for DBA; and some cards from an obsolete CCG. Apparently, last year was the first year they started supporting Toys for Tots at Fall-In. Besides collecting toys, they also get donations of games, models, figures, and supplies from vendors and individual modellers, and either raffle or auction off the donations. All proceeds go to Toys for Tots… it’s for the kids! I have no problem donating money to a good cause, so why not get something good out of it too? So with that in mind, I won two auctions. One was a set of foam core buildings, 28mm scale. These were built by hand with a printed veneer to add a great amount of detail without having to actually paint them. They’re the perfect scale and style for Malifaux, and they’ll complement our existing terrain nicely. I also won a 28mm Greek Hoplite army for DBA. It’s not likely to be a big winner in any tournaments, but it’s a better size for demonstrations and kid-sized hands, and it’ll allow me to play in 25mm DBA events in the future. I played in all of the events I planned to enter, except the Armies of the Americas event on Saturday morning. It was early: 9am; and I needed a time to dedicate to shopping without a time limit. Armies of the Americas was very similar to the 1491 event the night before, and I’d have used the same army for both events. Unfortunately I got sick of playing my all-bow army pretty quickly… but more about that later. 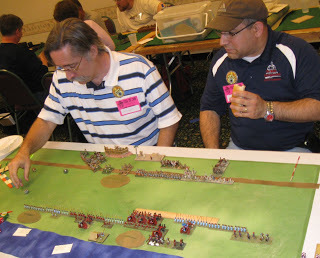 This was my first convention playing nothing but DBA. I don’t miss “all the random events” very much. The comraderie of playing a game I know I like with a group of opponents I’ve played with before more than makes up for the lack of variety. In the future, I wouldn’t mind spending one or two slots testing out some new rules if there’s something that looks really interesting, but I won’t miss it if that doesn’t happen.